The International Civil Aviation Organization (ICAO) has downgraded Thailand's aviation standards, "red flagging" the country for failing to address safety concerns. In March, the ICAO issued an alert on Thailand's aviation body after a safety audit revealed that it failed to adequately oversee its airlines. The move led to a ban on new flights to China, Japan and South Korea. Thai officials had then submitted plans to deal with the concerns in March. But, the ICAO "red flagged" the country's body on Thursday for failing to solve the issues within 90 days. Thailand's aviation sector joins 12 other developing countries, including Nepal and Sierra Leone, that have been downgraded to Category 2 from Category 1 by the organisation for its safety standards. An audit in January by the United Nations body had found that Thailand's aviation authority had a shortage of technical officers and issues with certifying the transportation of hazardous goods. 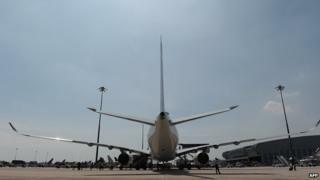 The warning meant the country's airlines had to cancel flights and refund or alter thousands of air tickets. The country's flag carrier, Thai Airways, said in a statement that it followed the "highest safety standards" in all operational areas, despite the red flag from the international regulator.